VoIP Integration extension allows EspoCRM to integrate with an Asterisk server through Asterisk Manager Interface (AMI), Twilio service and Starface server. For more details about the features, please click here. * these servers were tested with VoIP Integration extension. Step 1. Fill in the connection details of your Asterisk server. To do this, go to the Administration (System panel) -> VoIP » Asterisk AMI. Name – name of your connection. Host – IP or domain name of your Asterisk Server. Port – a port for connection through AMI interface. Password – AMI user password. Version of the Asterisk server – a version of your Asterisk server. Protocol – protocol for connection to Asterisk server (TCP, UDP, TLS). Dialout Channel – channel format for outgoing calls. It can be “PJSIP/###” (Asterisk 13+) or “SIP/###”, where ### is a user’s extension (internal number). The extension “###” will be substituted automatically depending on the user. Dial Context – context for dial actions. Connect Timeout – timeout for connection to Asterisk server. Read Timeout – timeout of read events from Asterisk server. Default Country – the country is used to format phone numbers. Dial Format for outgoing calls – a phone number format for outgoing (click-to-call) calls. List of ignored numbers – list of numbers which will be ignored. Popup window will not be displayed. Permitted Entities – entities that will be displayed in popup window and will be used to identify a caller by his phone number. Display Accounts related to Contacts – display only Accounts related to Contacts.. Automatically open the caller information – automatically open the caller information for incoming/outgoing calls. Access Key to EspoCRM – an access key of EspoCRM to post data from Asterisk server. Listen recorded calls – possibility to listen recorded calls in EspoCRM. URL to recorded calls – a pattern of recorded call URLs. 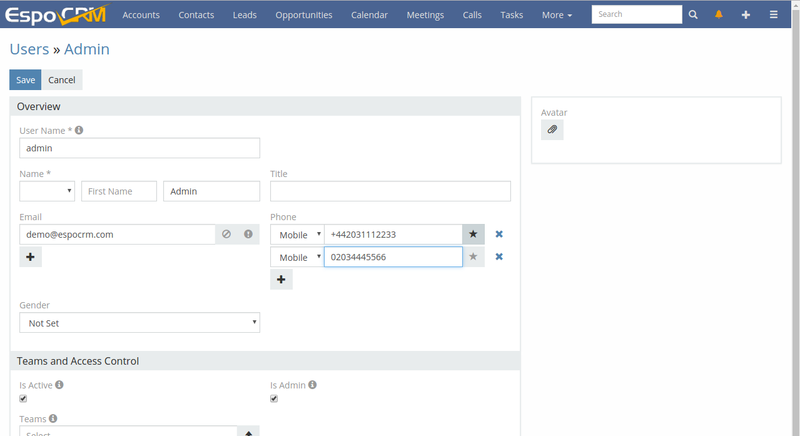 Quick Create Entities – entities which can be created through the call popup window. Lines– a prefix of phone numbers. E.g. UK phone number 702031112233 will be formatted like “7” – a line and “02031112233” – a phone number.. Active Queue Numbers – a list of queue phone numbers which should be determined by EspoCRM. Post URL – an URL which is used to post data from Asterisk server to EspoCRM. Each user who wants to use Asterisk integration, should setup his access in the User’s Profile, under “VoIP Settings”. Usually, it’s the SIP credentials. Also, the user can change some VoIP settings on this window. VoIP Server – your current VoIP server. 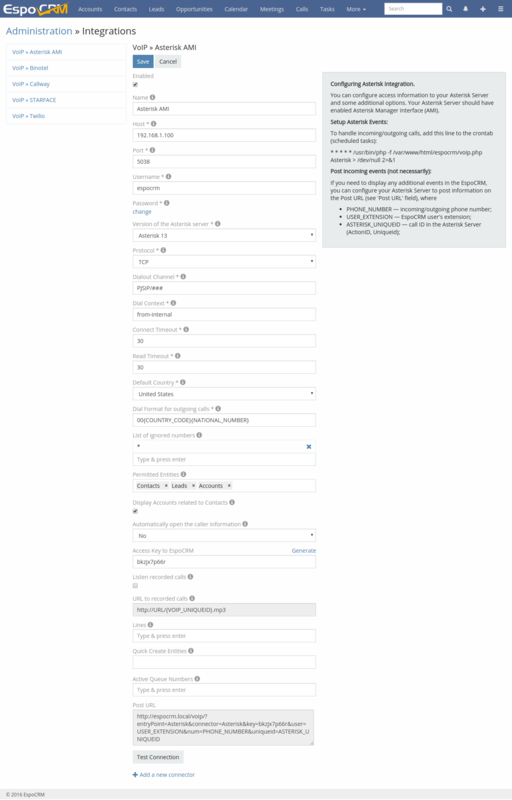 Your user extension – your internal user extension (SIP user) of the Asterisk server. Your VoIP password – your password of the Asterisk server. Display call notifications – an option to enable/disable incoming/outgoing call notifications. Silent notifications – mute notification sound. 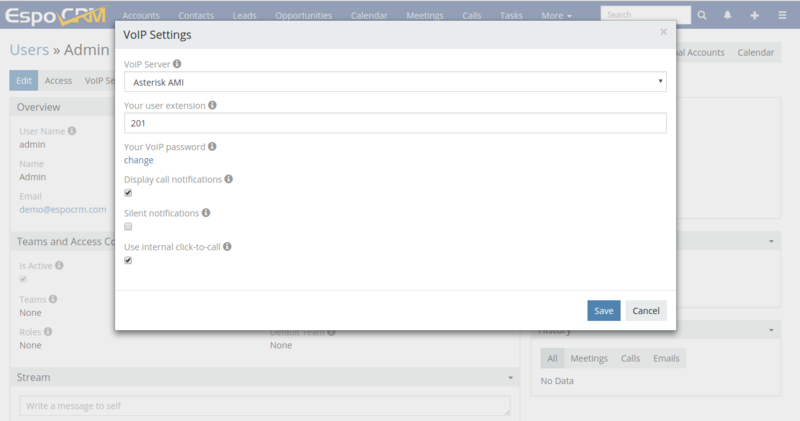 Use internal click-to-call – an option to enable/disable the internal click-to-call feature. It is a feature to make outgoing calls through Asterisk server. If the checkbox is unchecked, then an external application will handle “tel:” links. Each user can add several additional phone numbers to handle incoming calls. They can be added in the User’s Profile. Note: Additional phone numbers are used for incoming calls only. Outgoing calls will use the internal user extension. Phone numbers formats: +442031112233, 00442031112233, 02031112233.